Here's a quick card made with the My Favorite Things Die-Namics Chevron Segments Cover-Up. The sentiment is cut multiple times and layered, with the coordinating completion phrase stamped on a small banner. I really enjoyed using the Chevron Segments die! Of course, the extra pieces are all waiting for me to make a couple more cards. There are so many possibilities for this die! Well done, MFT, well done! This is a great addition to my collection, and one that will surely get a lot of use. It's usually pretty easy to chill out with the temperatures in Chicago in January. I didn't expect that it would be warm enough to have my door open while I worked on this card! I used this adorable stamp of our favorite winter friend, combined with several elements from the Simon Says Stamp January Card kit. Thank you for looking at my card! Greetings, hoppers! Welcome to my spot on the Club Scrap Blog Hop. If you've missed any blogs on the hop, or to see the complete list, check out Karen's blog post at the Club Scrap Blog. This month I've been inspired by my memories of the Club Scrap Retreat. I attended the October retreat for years, and tried something new this year by going in August. I had a wonderful time, with only one small problem... Secrecy! Yes! We all had to be quiet about the projects. In fact... I'm still going to be quiet! However, something that is not a secret (and you October retreaters better get working if you haven't yet!) is the ATC swap on the first night. So, what do you do with the ATCs you receive? You make this little ATC holder to give them a safe home! Also perfect if you participate in the Club Scrap Monthly ATC swap... make a holder every month to coordinate with the ATCs you receive. This is the front of the book. The string is attached on the bottom of the box-book, and wraps all the way around, and the weight of the beads and charm keeps the book closed. Here's what the book looks like when it's opened up. The top is constructed like a box, keeping the ATCs safe inside. The library pockets are made of vellum and glassine (I alternated them, three of each) so the ATCs are visible. The pockets are stitched onto the cardstock before it is adhered to the cover. This is a side view, where the stitched-in pockets can be seen a little better. This little book was fun to make, and didn't take very long either. I see some more of these in my future! I think some holiday-themed ones would be great to make, slipping little goodies into the pockets, like a gift card, tea bags, little jewelry attached to a card... fun fun fun! Thanks for stopping by... Now head on over to Jill's blog to see how she has transformed her Club Scrap kit this month! 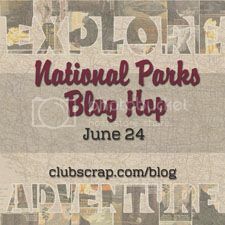 Welcome to my rest stop on the Club Scrap National Parks Blog Hop! Well, okay, Route 66 isn't really the same as it was, but summer travel and the National Parks - or other destinations - surely are! What better way to reminisce about a trip than to look back on your travel journal? I've made a simple little travel journal that can slip into your bag or glovebox, where you can jot down your mileage, keep track of your meals, and stow your receipts. The mini book uses just under one and a half sheets of 12x12 paper, so you could make a shelf full of these in no time! If you wanted more pages, there's plenty of room for a few more, too. Score the paper for the pages at 3", 6", and 9"
Rotate the paper 90 degrees, and trim at 7" and 5" so you have two pieces measuring 5"x12". Fold at the score lines, accordion style, overlapping flaps in the middle. Trim the outer flap on a diagonal to form a pocket, carefully adding adhesive around the sides and bottom so there's plenty of room to tuck in some treasures. Cut a piece of contrasting cardstock for the cover, measuring 5"x12". Score at 3", 3.5", 6.5", 7", and 9.5". Fold the 2.5" flap down and adhere. Use a corner-rounder to round the edges of the flap. Fold at the score lines to fold the cover into shape. You will have a 3"x5" book, with a .5" spine, a .5" flap-spine, and a 2.5" flap. Using the inside page strip, fold the lefthand flap under, and adhere to the inside cover flap. This will make a nice thick cover with a rounded edge, nice and sturdy to take on your adventures through the parks! Adhere the right-hand flap to the inside cover, leaving the .5" fold and the 2" folder flap free. Add cutaparts, journaling blocks, or photos and embellishments as you desire! I hope you've enjoyed this month's Club Scrap Blog Hop, showcasing the National Parks kit! In case you've missed anyone's blog, or feel the need to stock up and get ready for your own summer adventure, head on back to the beginning at Club Scrap! 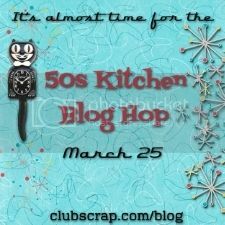 Club Scrap Blog Hop: 50s Kitchen! Welcome to my spot on the Club Scrap Blog Hop! This month my daughter and I have been spending some time on our kitchen, baking Madelines and cookies and mini cakes. These cheerful little treats to surprise our friends and neighbors have inspired my project this month! Here's a little pop-up box card that looks simple when it comes out of the envelope, but opens up into a cheerful splash of treats for the eyes. The bright colors and spunky images of the 50s Kitchen kit are just perfect for this card. There's a lot of stuff in there! Ranger Dye Inks: Classic Cherry, Caribbean Coast, Black Tie, Lily Pad, Electric Lime, Java Bean, and Lemon Twist. I hope you've enjoyed this cheery little card, and the Club Scrap Blog Hop! Your next blog to visit is Wendy's Life Paper Soul, and you can return to the beginning of the hop at Club Scrap to make sure to see all of the wonderful projects posted today. 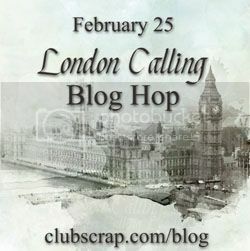 Club Scrap Blog Hop: London Calling! Welcome to this stop on the Club Scrap Blog Hop! In the meantime, here's a little project that shows our love for the grand old city of London and its country. This is a 12" x 8" canvas that was first painted, and then collaged with papers and an embossed telephone box. I added some dimension on top of those layers with Ranger's new Transparent Gloss Texture Paste and the Club Scrap Tin Tiles Anniversary stencil. The letters were made by covering some thin chipboard with Vintage Mini Postage Stamps from the Club Scrap Lite kit, and die cutting them, then coloring the edges with black marker. I used a very vintage embellishment -- a Making Memories vellum tag (circa 2002) -- which I embossed with gold embossing powder, then stamped and embossed with red and blue embossing tinsel. This was followed with an assortment of embellishments. I used nearly every variety of item included in the Club Scrap kits! I hope you've enjoyed visiting my blog on the Club Scrap London Calling Blog Hop! Your next stop on the Hop is at Wendy's blog Life, Paper & Soul. She's one of the artists on the new Club Scrap Artist Team, so it's sure to be a treat. Welcome to my blog today, and Happy Valentine's Day! I hope your day is sweet as a Valentine treat. For Valentine's Day, I've made a little stitched book that is perfect for holding small photos and little notes for someone you love. This book is made using Club Scrap's new Love Ink kit. It's a smallish book, measuring 3.75 inches wide, and 5 inches tall. It is embellished with cutouts and dimensional stickers from the kit. 1. I had an idea (almost always a helpful place to start!) so I started sketching it out in my composition book, and planned how many pages I wanted, what size they should be, and how to cut them out of the 12x12 papers. I also worked out how to stitch the spine and add in both the dimensional heart stickers and some beads. 2. Next I cut the papers down. They are nested into two types of signatures, the pages themselves, and some spacer signatures. The spacer signatures are both decorative, and serve the function of balancing the spine after photos and cutouts are added, so the book will be the same thickness at the spine and the outer edge with the ribbon tie. The signatures of pages are graduated as well, so there are decorative spine balancers in the middle and a smaller piece nested inside a larger. This makes every page colorful, and inner pages of each signature don't extend past the outer ones. After the pages and spacers are cut, they are all scored in half vertically. Sometimes it's nice to have a friend guard the cut papers while you're scoring! 3. Next, the spacing of the holes from the stitching plan are marked onto one of the spacers. 4. Once the holes are pierced into the spacer, the spacer is used as a template to pierce the holes in all of the other pages. You might want to get a nice relaxing cup of tea before starting this process, because this is a LOT of hole-piercing! 5. Now it's time to set up all the materials for stitching: a needle, waxed linen thread, the dimensional heart stickers, a paper piercer, beads, and the signatures to be sewn together. I also have the stitching guide, so I know the placement of beads and hearts for page signatures. The spacer signatures are sewn onto strips of ribbon, without extra embellishment. 6. I added the dimensional stickers to the spines as I went along, as they aren't super-sticky, especially when trying to get them to stay right on the fold. A paper piercer was used to make holes in the stickers to line up with the stitching holes. 7. After the signatures are sewn together, the covers need to be prepared. Cut the bookboard to the size of the largest (outside) pages, 3.75 x5 inches. When cutting bookboard, I use a bit of tape to hold the ruler in place so if I need to take a little break, the ruler stays in the correct location. 8. After the boards are cut, they are covered on one side with patterned paper. The ribbons that are part of the binding are glued down with a wee bit of bookbinding glue. The ribbons that will tie the book shut are also glued down to extend on the edge of the book. Next, apply a conservative amount of glue to the entire back side of the cover, and adhere to the back of the book, over the ribbons and thread end; repeat for the front cover. 9. All that's left is to add a little embellishment to the front cover, and place the cute cutouts throughout the pages! Here are a couple more views of the completed book. When it's open, it will pop open into a circle standing up. You can see when it's closed and you look down at the top that there is plenty of room to add photos and other embellishments without worrying that the book won't tie shut properly. It makes all that hole-piercing worthwhile! And here's a final look at the book, along with spine detail. 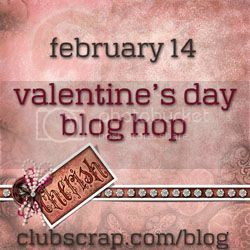 I hope you've enjoyed this stop on the Club Scrap Valentine's Day Blog Hop! If you have any questions about the project, please don't hesitate to ask. Your next stop will be with Anne Marie at her blog Artfully Balanced. If you haven't seen all of the blogs in the Club Scrap Valentine Hop, you can start at the beginning! Thanks so much for stopping by, and have a LOVE-ly day! This month's Club Scrap kit theme is amazing! It's London Calling, and the images are fantastic, with unmounted rubber sheets filled with a taxi, a double decker bus, the London Eye, a telephone box, Big Ben, and so much more. I've made a tag following the style and techniques of the February tag for Tim Holtz's 12 tags of 2015. It is completely appropriate for me to make a London-themed tag for a Valentine-oriented challenge, as I love London! Ranger Distress Paint in Faded Jeans, Fired Brick, Tarnished Brass, and Picket Fence. Tim Holtz Idea-ology: crown charm, word label, brads, arrow, and heart charm. Check out this kit! Enjoy it, it's fabulous! Cheerio! A quick little card using a few beloved scraps of paper that I could never bear to toss out. Was the By the Seashore kit really 12.5 years ago? Yikes! Club Scrap papers used: blue background and tan strips: By the Seashore; seahorses: Destinations; sand dollar: Gratitude; white background and heavyweight vellum are also CS. I hope you enjoy this little card! I received a gift of some Project Life Photo Pocket Pages over the holidays, so I've decided to try making some of these pages using my Club Scrap kits. The Club Scrap January kit's theme is Constellations, and the first thing that came to mind was this photo of Cathie and her friend both reading The Fault in Our Stars. Her friend is a big reader, but Cathie is not, so any book that captures her interest this much is fantastic in my book! I stamped and embossed the sprinkled stars border on the 4x6 journaling card and photo mat on the bottom; the round constellation stamp was embossed on a 4x6 piece of navy printed cardstock, and then cut in half to surround the image of the book cover.